We've joined forces with The Scottish Library and Information Council (SLIC) to pilot a series of film education projects in libraries aimed at offering communities access to information, activities and resources on film creativity and culture. The pilot programme was launched today by the Cabinet Secretary for Culture, Europe and External Affairs Fiona Hyslop at Bo’ness Library, where she was given a guided tour of the Stars of Silent Film in Scotland photography exhibition. The exhibition is part of the Hippodrome Festival of Silent Cinema 2016, taking place in Bo’ness from Wednesday 16 March to Sunday 20 March. Creative Scotland has allocated £190,000 to fund seven projects at a number of public library authorities to develop creative film learning in libraries and improve the provision of film and moving image education across Scotland. The library authorities include East Renfrewshire Council, City of Edinburgh Council, Falkirk Community Trust, Midlothian Council, Culture North Lanarkshire, South Ayrshire Council and Western Isles Council. Projects will take place over 18 months from April 2016 and will include training for staff to create ‘film teams’, community engagement activity, extending DVD collections, film screenings, film clubs for different age groups and covering various genres and activities relating to the education of film archive and film-making. The National Libraries of Scotland will be a key delivery partner to provide content from its Moving Image Archive. 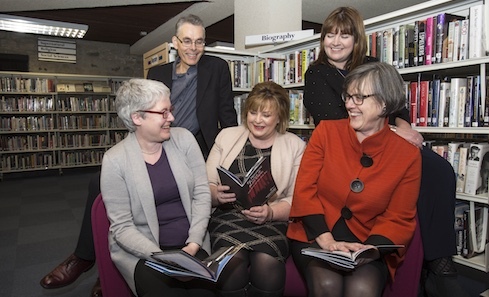 Pictured: Pamela Tulloch CEO, SLIC; Anna Heron, Bo’ness Library; Lesley O’Hare, Culture and Libraries Manager, Falkirk Council; Scott Donaldson, Creative Scotland and Fiona Hyslop. "The Scottish Government places great importance on public libraries and believes everyone should have access to library services. These pilot projects, supported by SLIC and Creative Scotland, demonstrate that our libraries have the ambition to engage in new activity and deliver on the recommendations set out in the first national public library strategy to promote their role as cultural centres, inspiring people through books and literature, music, film and theatre and encouraging creativity. "The Scottish Government welcomes the enthusiasm libraries have shown to work in this new area and the partnership working between funded organisations to deliver creative opportunities in local areas." The Scottish Library and Information Council (SLIC) is the independent advisory body to the Scottish Government on library matters. For more information on SLIC visit www.scottishlibraries.org.